The annual Ettinger Book Artist Series lecture was held on Thursday, November 7, 2013 at 7:00 pm in Special Collections on the fourth floor of the Golda Meir Library. The 2013 presenter was Karen Kunc, a book artist, printmaker, and Cather Professor of Art at the University of Nebraska-Lincoln (UNL). The Ettinger Book Artist Series is always free and open to the public. Ms. Kunc has been proprietor of Blue Heron Press and taught at UNL since 1983, and has developed an international reputation as a printmaker and book artist. Her prints and artists books derive from her contemplation of natural forces in the world, exploring inventive color abstractions of both the natural and human-fashioned environment. Her well-known, unique style of printing is applied to notions of creation, preservation, and allusions to human myth and metaphor. Her prints record the processes of destruction and creation inherent in her reduction woodcut technique, establishing impressions that she refers to as “strange beauty.” Her Ettinger presentation will focus on the physical and metaphorical nature of her artist’s book-works. Ms. Kunc’s works are represented in collections worldwide, from libraries such as UWM, Boston Public, Library of Congress, Harvard, and the Walker Art Center Library, to major museum collections, including the Milwaukee Art Museum; the Museum of Modern Art; the Philadelphia Museum of Art; the American Art Museum; the Smithsonian Institution; the National Art Library of the Victoria and Albert Museum, London;, the Machida City Museum of Graphic Arts, Tokyo, Japan; the Hyndai Art Center Gallery, Korea; and the Reykjavik Art Museum, Iceland. Her many awards include two Fulbright Fellowships to Finland, a Fulbright Specialist grant to Dhaka, Bangladesh, and two National Endowment for the Arts Fellowships. In addition to her presentation at the library, Karen Kunc also spent the week at the UWM Department of Art & Design working with students and staff on a series of print workshops, and she offered a separate lecture on her prints and printmaking techniques in the Art & Design Department’s Artists Now! Guest Lecture Series, Wednesday, November 6, at 7:00 pm in the Arts Center Lecture Hall. This lecture was also free and open to the public. For more information, please contact Special Collections at 414.229.4345 or libspecial@uwm.edu. 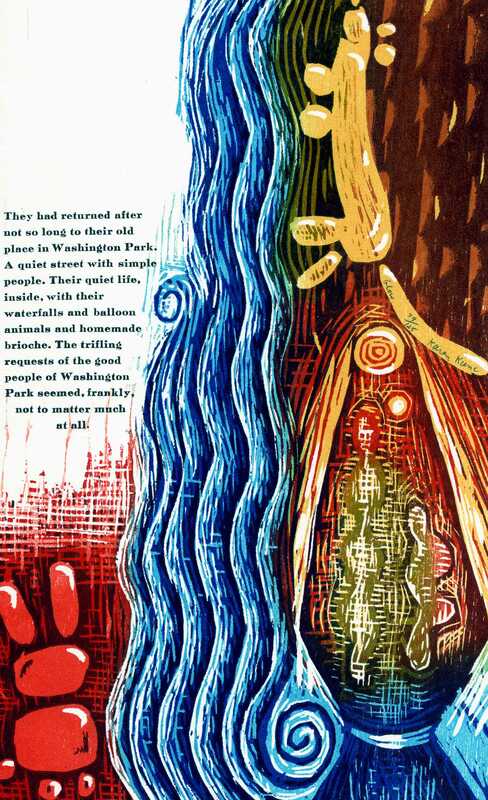 Image: “Glow,” reduction color-woodcut print by Karen Kunc, from The Everyday Magic of Walterlee Higgins by David Haynes (Minnesota Center for Book Arts, 1998).